Steel, a novelette, was first published in the May 1956 issue of The Magazine of Fantasy & Science Fiction. 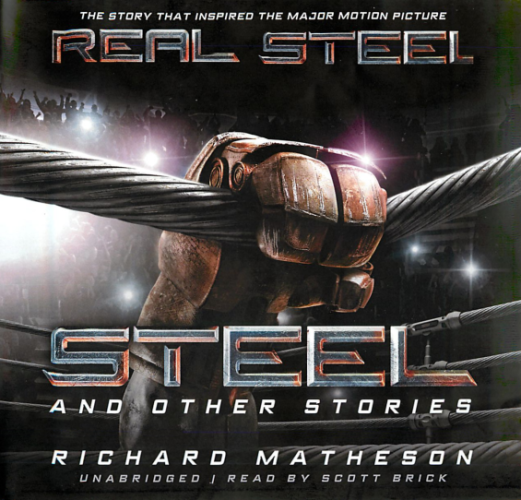 The editorial introduction preceding it described Steel as a “tale of strength and endurance” and as “a science fiction sports story so realistic, simple and powerful that it should prove moving even to sports-loathing readers who have never let a boxing bout darken their television screens.” The story would just a few years later, in a 1963 adaptation as an episode of the Twilight Zone brighten the living rooms of many. And, in 2011 it would inspire the big budget movie Real Steel. So, how does the original novellete, stand up to repeated blows of history? Pretty well. 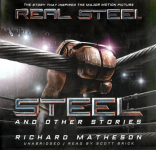 If you like Matheson’s writing Steel is definitely worth hearing. This story captures in a relatively short space the oddity, the kind of quirk that Matheson seems forever working on. It’s something I’ve noticed in practically every story by Matheson that I’ve read. His main characters always seem to want to make a human connection with strangers, and in their efforts to do so always fail – and always for the same reason. In their desire to be heard, and be understood, they always disregard the needs and desires of those strangers. I’ve never seen a writer tackle anthing like this, over and over, like Matheson always seems to. Let’s tale Steel as our example. One of the two main characters, Paul, goes to great lengths to get engage an uninterested stranger in a conversation about the exploits of his dilapidated robot boxer. That the stranger, who doesn’t know anything about boxing, doesn’t care about boxing, and has never even heard of Paul’s robot, is obviously completely uninterested in what Paul is saying. This doesn’t seem to occur to Paul. It’s as if Paul’s own need to reach out and be heard – to be something – is greater than the interests of the stranger – whatevber those interests might be. It’s not so much a Science Fiction issue as it is an existential one. It’s almost as if Matheson is using his fiction to try to find a way to navigate around a massive blind spot in human relations. Like in his novel The Incredible Shrinking Man Matheson has the plot of Steel be a manifestation of a character’s internal difficulties. 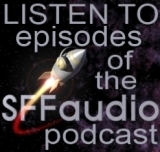 Scott Brick narrates this bare bones dialogue driven story. I’m often ambivalent about Brick’s narrations. Sometimes he works for me, sometimes he doesn’t – and I think I’ve finally realized why. Brick is excellent at delivering emotion. But if the emotion is from a third person perspective it comes across as too operatic. But, if the story is told in first person perspective then it work well. In Steel there are basically only two voices – Paul’s and Kelly’s. And when Brick voices either one I can’t readily enough distinguish difference between them. Yet when a story is told in first person Brick’s narration really works. Take this sample |MP3| from Nelson DeMille’s The Lion’s Game (which is first person perspective). And now compare it with this |MP3| from Steel. I came away feeling somewhat unsatisfied with Steel. It’s not that the story is uninteresting, or unoriginal, Steel is both original and interesting. Kelly and Paul are a pair of boxing enthusiasts – and I’m more of an enthusiast of ideas. There’s just not enough intellectual heft to their journey. I think The Twilight Zone adaptation, penned by Matheson himself and starring Lee Marvin, does the story better mostly because it’s a lot quicker too it. The movie version is hardly an adaptation, being much more of a family father and son traditional conservative values tale than an existential exploration. None of versions of the story did what I wanted them to do, namely get into the robot’s POV. The fact that none of the adaptations treat the robot as anything other than an external manifestation of their root interests is kind of depressing. But then again, I don’t go to Matheson for uplifting, I like his depressing ideas. It was great seeing the young Lee Marvin again. The lovely old black and white seems far superior to what has become cliche and unconvincing computer graphics.